Dropped into the Waterview Sanctuary at Sorell over the weekend. This sanctuary, once the local tip, was at one time a 'not to miss' site for wader watching over the bay, but sadly waders have largely been replaced by gulls and ravens. I still go there, perhaps more in hope than expectation these days, but it can surprise. As I got out of the car, I was immediately aware of a number of Forest Ravens kicking up a fuss. Walking towards the ruckus, based in an old acacia overlooking the bay, 2 raptors took flight in opposite directions pursued by ravens. One immediately disappeared from view, the other alighted in a nearby acacia, giving me my first opportunity to ID it. 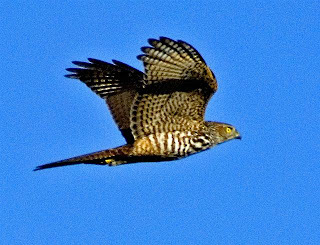 As I suspected, it was a Brown Goshawk, a species I've recorded here several times recently. It remained in the centre of the tree, with ravens mobbing it from a safe distance. As I approached, it took flight, this time landing on the chicken factory perimeter fence, as seen at middle left image. It changed position several times within the factory boundary, before flying to the Blue Gum plantation. I took the shot at top as it flew past. No sooner had it disappeared, than the ravens again became quite disturbed, and searching for the cause was just in time to see a Peregrine Falcon stooping at some speed across the nearby paddock. Whatever it was after, it missed, climbed, circled briefly before disappearing to the West. I wandered round the coastal edge of the reserve for about a quarter of an hour, before the Kelp Gull flock, around 500 metres away, took flight circling and calling. Guessing it was probably a Sea Eagle, I scanned the distance with my binos, eventually finding a soaring Sea Eagle, by now over 5 Mile Beach. Within minutes, another buzz among the local birds made me aware of yet another predator, this time a Brown Falcon, flying in from the West. I managed a quick photograph, (bottom) as it passed at some speed, for a "brownie", calling as it did. The call was returned by another Brown Falcon almost overhead, before they joined in flight and disappeared over the township. So if you're lucks in, this site may still be worth a visit!